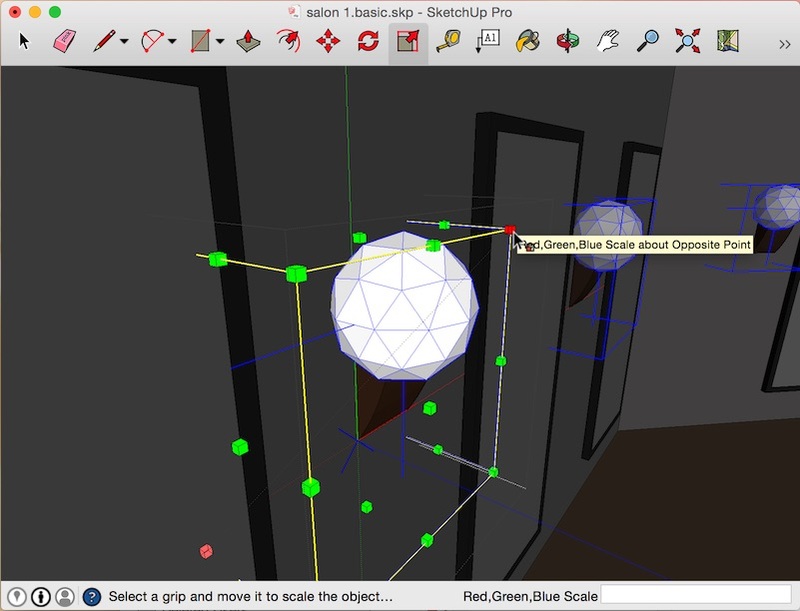 This tutorial is a step-by-step guide in rigging an interior model for LightUp. 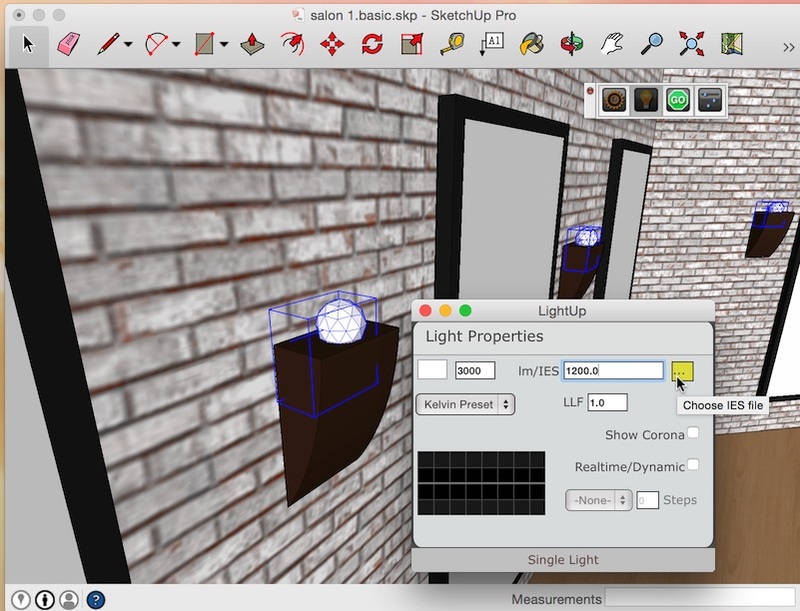 It covers basic lighting as well as setting up materials for realtime reflections. 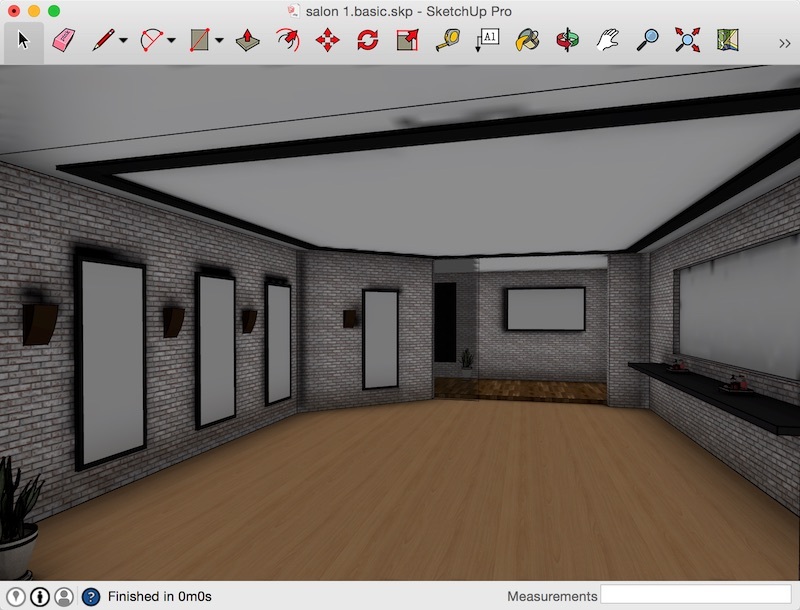 The model can be downloaded for each stage of the tutorial so you can follow along and try out the techniques. 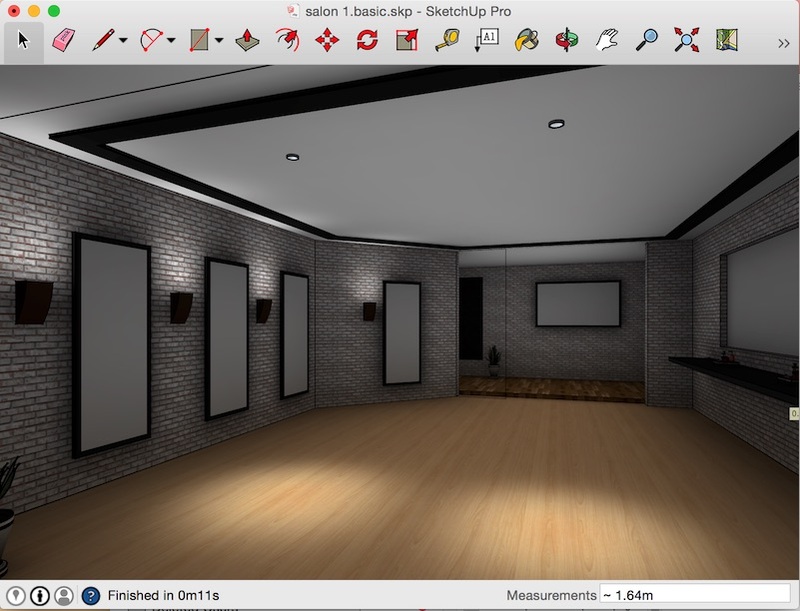 We start with an empty room with no lighting and we're going to build it up step by step to the final render. 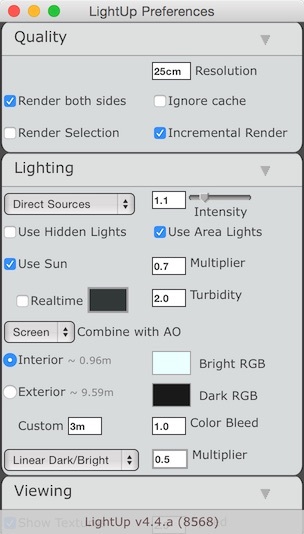 Open LightUp Preferences showing default settings. 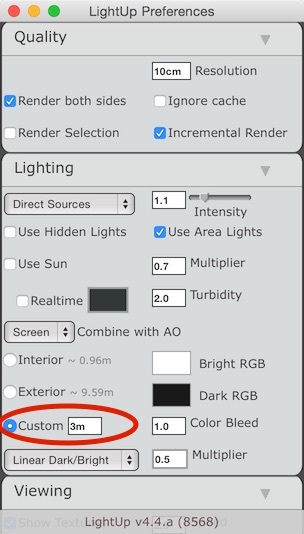 NB If you have the simplified LightUp UI showing, scroll down the dialog and click on the "Use Advanced GUI" button at the bottom of the Preferences dialog. 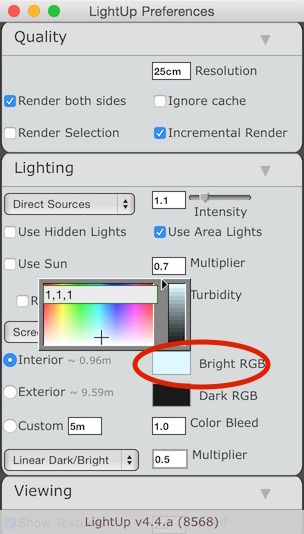 Change the Bright RGB from daylight (pale blue) to white by clicking on the color sample box which will pop-up a color chooser and type '1,1,1'. Or you can use the crosshair to make it a white color. 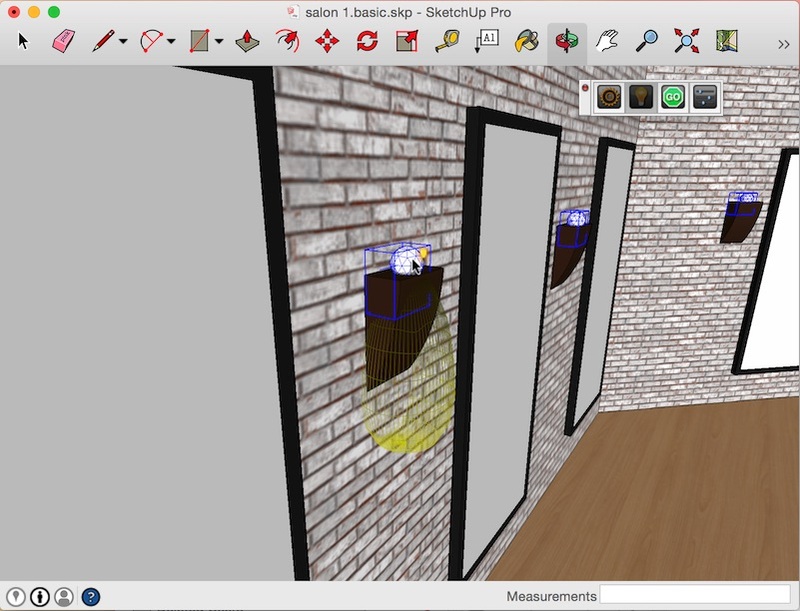 We are going to change Resolution to '10cm' so we capture the details on the walls. Generally we start with a larger distance for Resolution and reduce to increase the quality. Start TourTool and wait for the Incremental Render to complete its pass on the current viewpoint and you should see something like this. 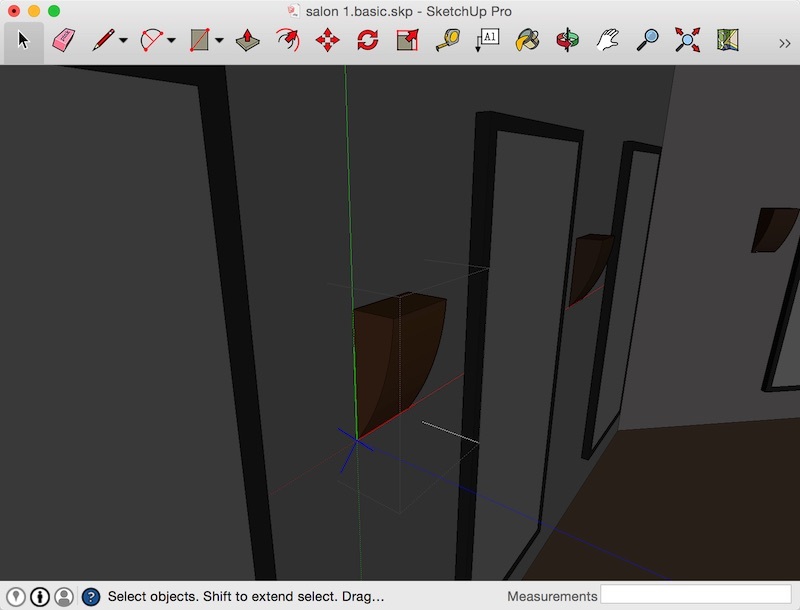 NB You will notice a few dark spots in the corners, these are completely normal and will disappear when we do a Full Light (unchecked Incremental Render). What we are checking is the general lighting levels. 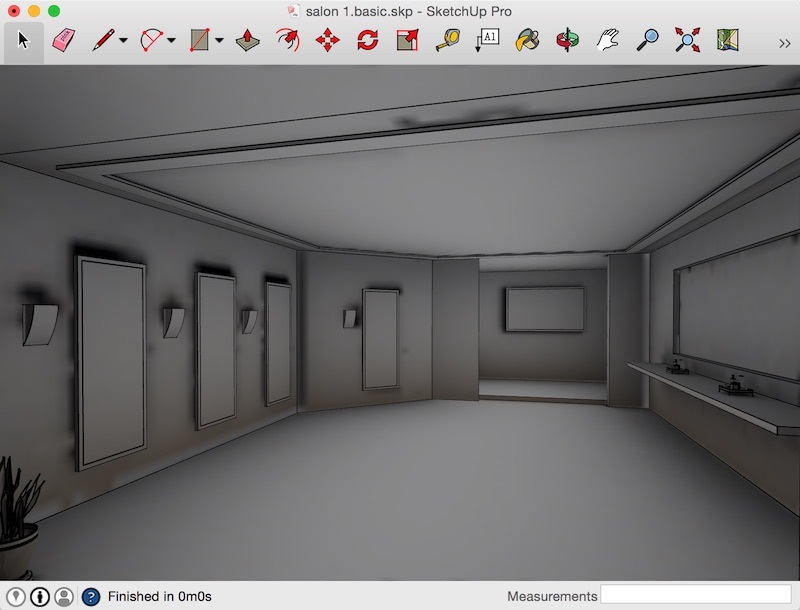 With just Ambient Occlusion using Interior preset, we are not seeing much depth - most of the scene has the same lighting levels - just a little darker under the shelves on the right. Move around your model using the arrow keys and mouse. When you stop, LightUp will update the lighting. 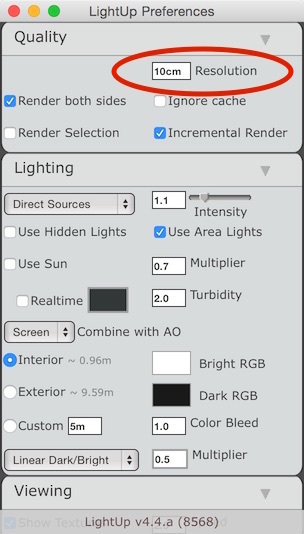 In Preferences, next to the Interior preset LightUp is showing the distance at which to stop searching for occlusion. It shows 0.96m, meaning anything further than about 1 meter from a surface will not effect Ambient lighting. We are going to switch Custom Ambient Occlusion cut-off distance and enter 3m so we get more AO contribution into the room. 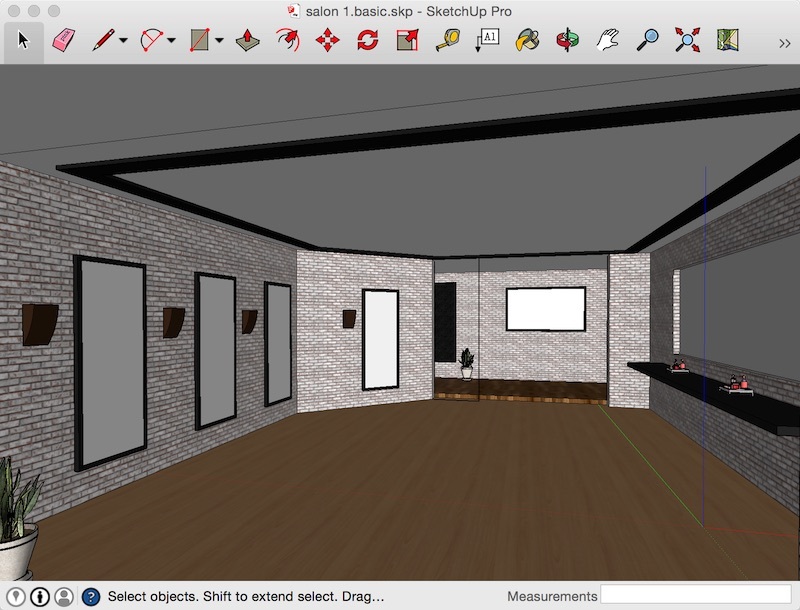 TourTool render should show something like this. 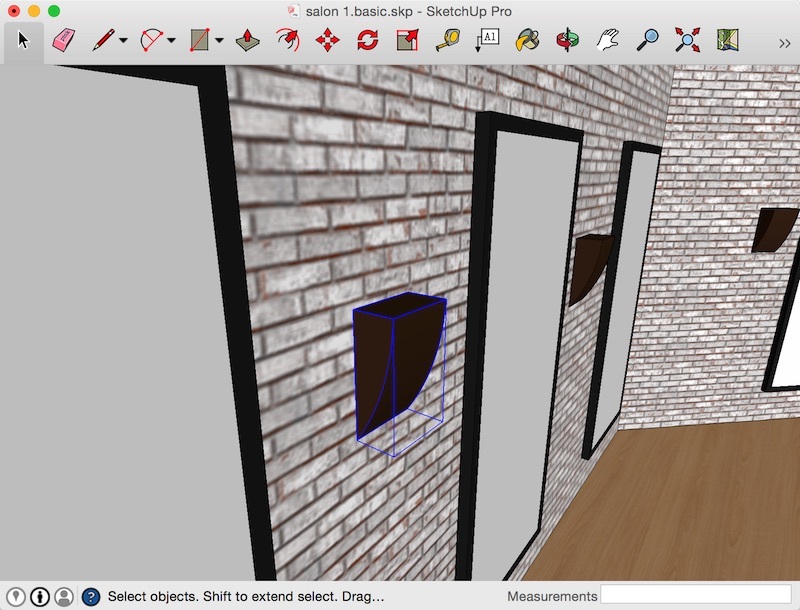 It is useful to view your model with no textures and just lighting - sometimes called Clay Render. 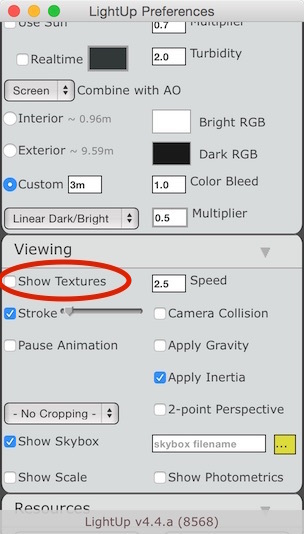 We can do that by opening Preferences and unchecking 'Show Textures'. 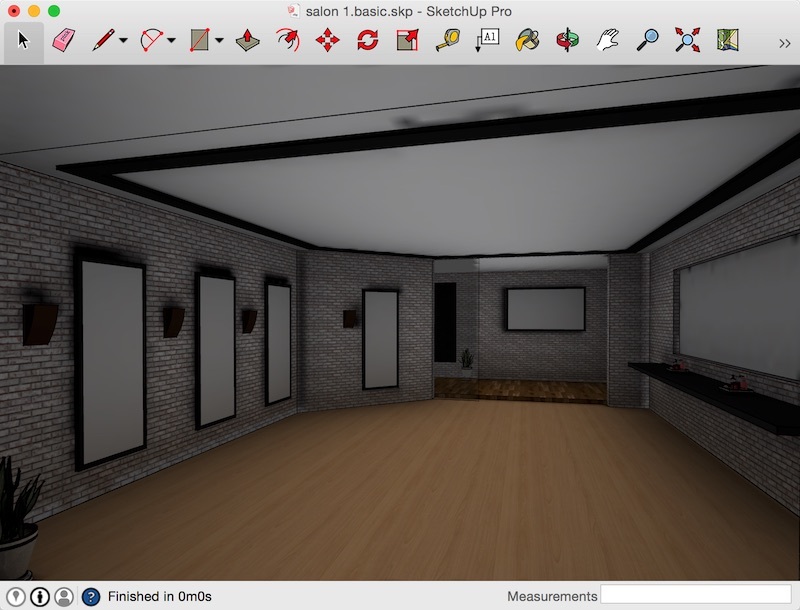 We have some good AO depth now and we can see some diffuse reflection from the wood floor onto the walls giving a brown coloring. Time to add our first Light Source to wall sconces. 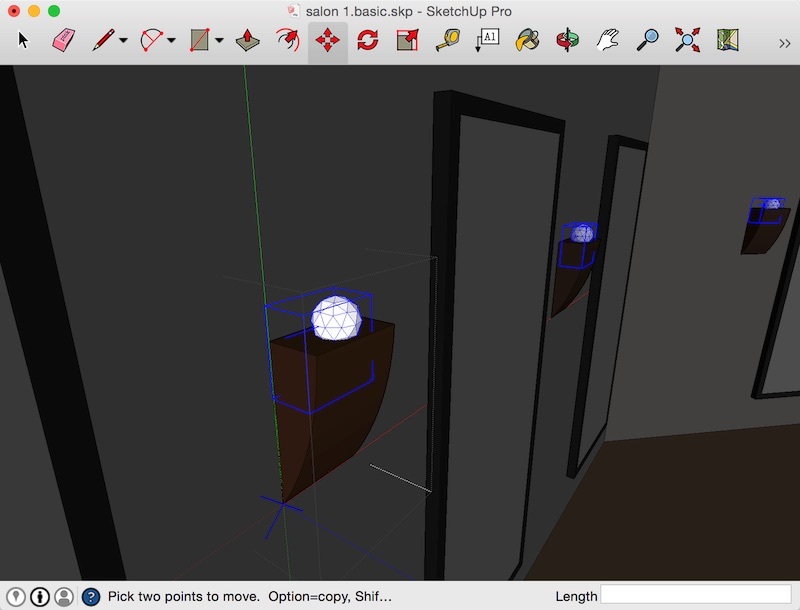 Open the sconce component by double clicking. Choose QueryTool from the LightUp toolbar. Drag a green corner grab while holding Ctrl (Alt for Mac users) to scale the Component around its center to a size that you are happy with. Move it to the top-center of the sconce again. NB Light emits from the center of the PointLightSource, so make sure the center of the PointLightSource is not embedded in a surface as this will block any light. Close the sconce Component and notice that all instances of the sconce now have a PointLightSource. 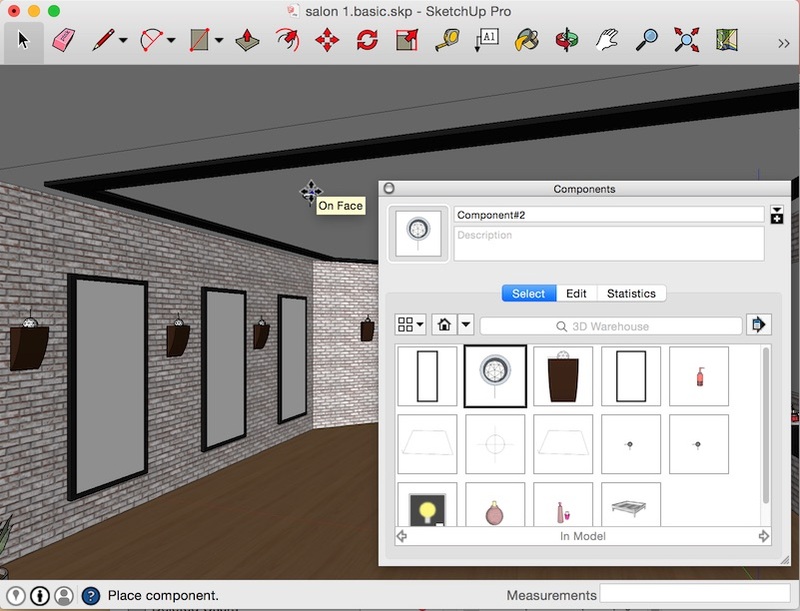 Choose the QueryTool and click on the sconce PointLightSource (you don't need to open up the Component, LightUp will 'reach inside' the Component) to show the Light dialog. The PointLightSource defaults to a simple 1200 lumen omni-light. 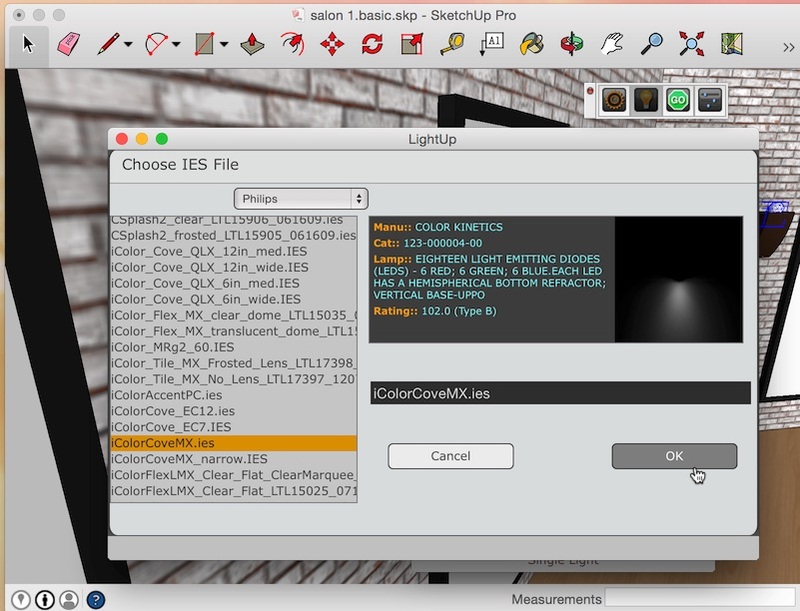 Click on the yellow IES file chooser button to select an IES light profile for the PointLightSource. LightUp will show the IES file browser from which you can browse and select the IES file you want to use. We are gong to be using a Philips/ColorCoveMX IES profile. 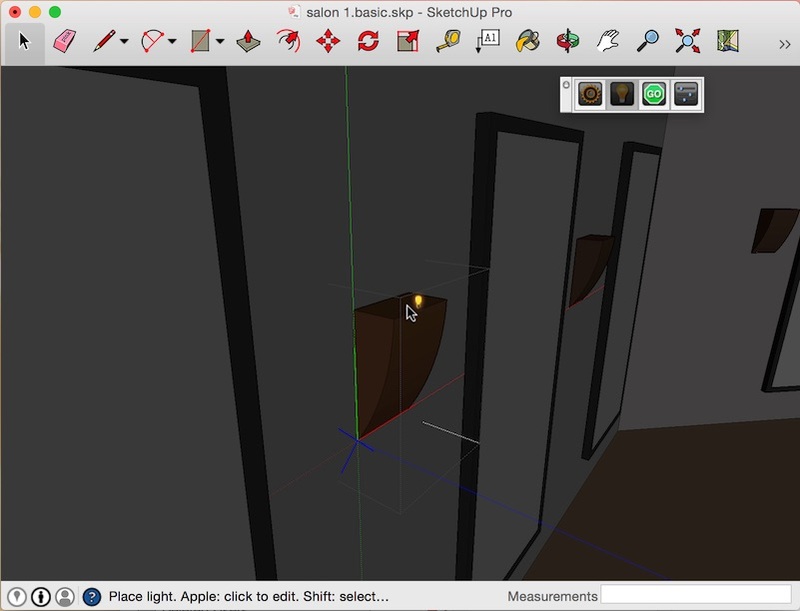 Select an IES file and click OK.
With the QueryTool still selected, hover over the PointLightSource and you'll see LightUp shows the shape of penumbra your selected IES will be casting. You can see it pointing down the wall but we want this be an uplight. We need to change the orientation of the PointLightSource. LightUp makes this very easy. Move the mouse pointer on the wall surface above the PointLightSource with Ctrl (Alt on Mac) pressed, left mouse button to aim the IES light at this location. Notice how all Component instances are updated. 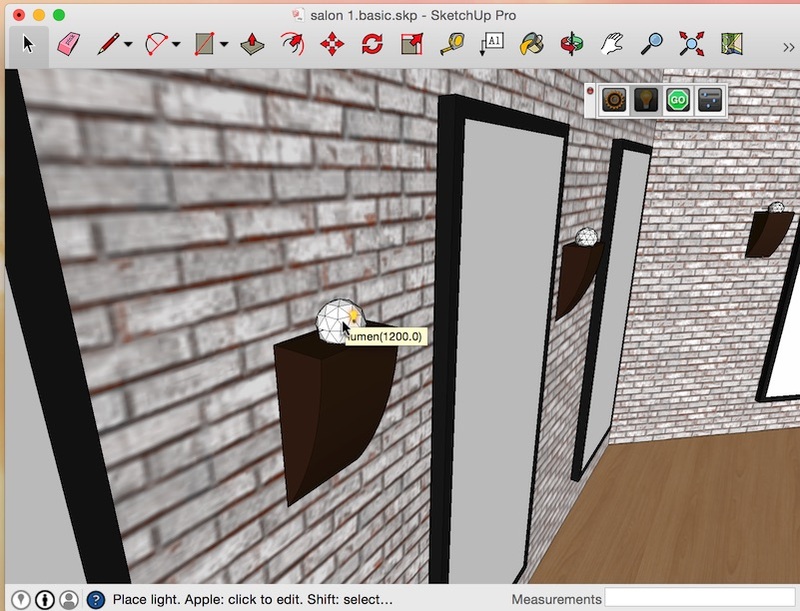 Start TourTool to see the effect of the uplighting from the sconces. Now open the SketchUp Component browser and select the Component named "Component#2"
Drag the Component#2 component into your model and drop it on the ceiling. It will automatically cut an opening in the ceiling. The downlighter component has a PointLightSource embedded inside ready-rigged with an IES light source. 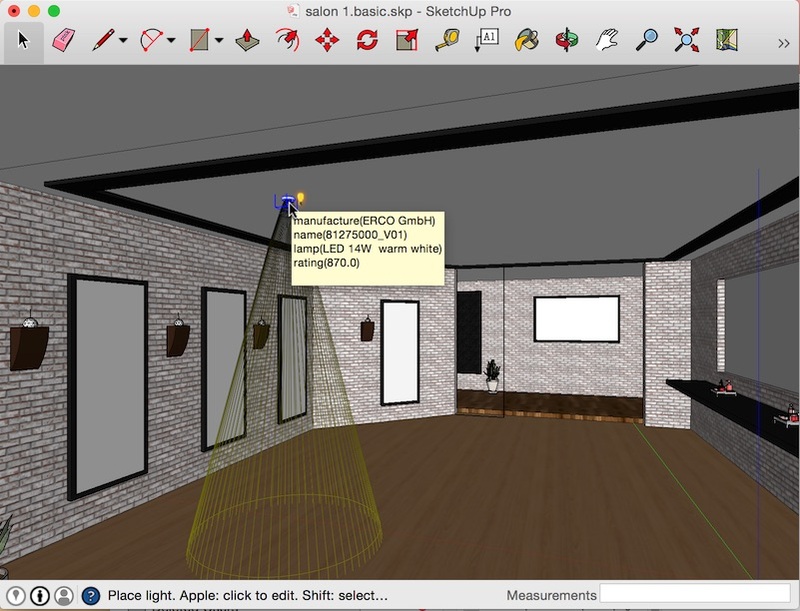 Choosing the QueryTool and hovering over the PointLightSource will show luminaire details. Try adding some more Component#2 components. 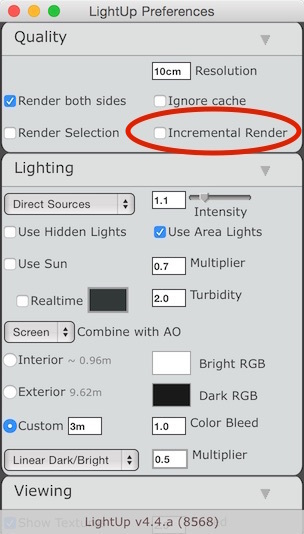 In Preferences, uncheck the Incremental Render checkbox to do a full lighting bake. 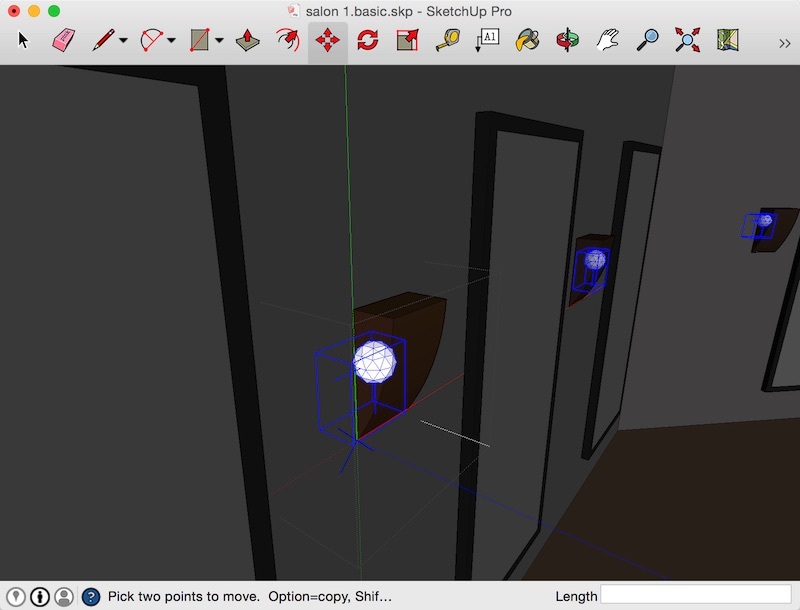 Start TourTool and you should see your room lit by the sconces and any downlights you added. This concludes the first part of the tutorial. We have learned how to do basic rigging of a room with Ambient Occlusion and IES lights. 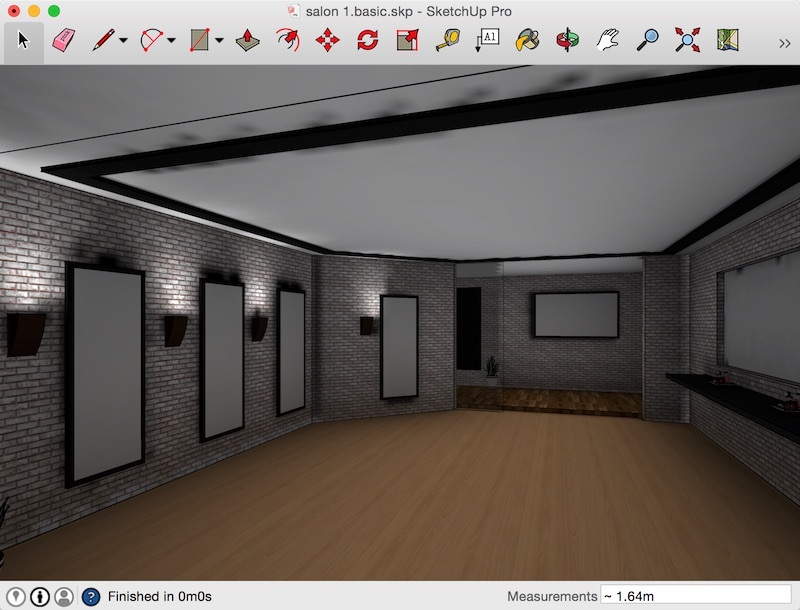 In the next section, we'll check lighting levels and edit materials.